Stocking stuffer. 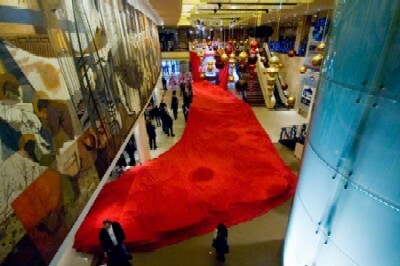 The Sony Centre for the Performing Arts in Toronto recently broke the Guinness World Record for the world’s largest Christmas stocking. The super-sized stocking measured 90 feet 1 inch in length and 37 feet 1 inch from heel to toe. The stocking was filled with toys to be donated to the Salvation Army. Rich chocolate. “A New York eatery is offering a $25,000 dessert bulging with top-grade cocoa, edible gold and shavings of a luxury truffle. The Frrrozen Haute Chocolate was declared the most expensive dessert in the world on Wednesday by the Guinness World Records. The dessert is a frozen, slushy mix of cocoas from 14 countries, milk and 5 grams of 24-carat gold topped with whipped cream and shavings from a La Madeline au Truffle.” So, you can follow up your $1,000 dollar bagel for breakfast with a $25,000 chocolate dessert. Is all the food in New York this expensive? A week after Serendipity 3 announced it had achieved the world record for the most expensive dessert, the famed Upper East Side ice-cream parlor and restaurant has been closed by the health department for a rodent and insect infestation. I posted a poem by Wendell Berry recently, so I was interested to read this interview with Berry in the Minneapolis Star Tribune. In the interview Berry talks about the difference between a total economy, in which people “pay for everything; they are total consumers,” and a local economy, in which people “take back a certain amount of economic initiative and do things for themselves.” He then applies this concept especially to sustainable agriculture and the purchase of food. There is a movement toward the local economy. And it’s coming about as a response to people’s understanding of the costs to the world of an economy based entirely on long-distance transportation. They say that the average distance that food travels from the field to the dinner plate is 1,500 miles. And this has a cost in fuel depletion and pollution. It’s a part of the permanent drawdown of necessary resources that are the basis of an industrial economy. I found this article interesting, especially the reminder that much of our food travels hundreds if not thousands of miles from the field to the dinner table. We live in an area with lots of local agriculture and enjoy this time of the year tremendously. Last night for supper we ate freshly picked corn from a local farm and our salad items were grown locally as well. There is something just so good about fresh vegetables from the local market. How about you? Do you take advantage of locally grown food when you can? World Magazine’s blog post, Do you have a children’s menu? prompted some lively discussion on the pros and cons of children’s menus. I liked the following two comments about chicken fingers. Comment #2 – Chickens don’t have fingers. Be very suspicious. Comment #6 (responding to comment #2) – “Chickens don’t have fingers.” Not any more. Personally, my wife and I love the idea of a children’s menu. The price is right, and our boys always found something that they liked. We used to eat at a Mexican restaurant that had a novel approach to their children’s menu. “Kids under twelve pay what they weigh,” read the sign out front. At a penny a pound, our boys ate for 40-50 cents each. Of course, “kids eat for free” is always the preferred alternative. Now that the boys are older, bigger, and could eat the entire children’s menu all by themselves, we pay full price for the older two. But our youngest can still eat a children’s meal – at least for now! Last week I linked to Christianity Today’s photo essay on church hymnals from around the world. This week let me recommend Time Magazine’s photo essay: What the Word Eats (“What’s on family dinner tables in fifteen different homes around the globe? Photographs by Peter Menzel from the book Hungry Planet”). 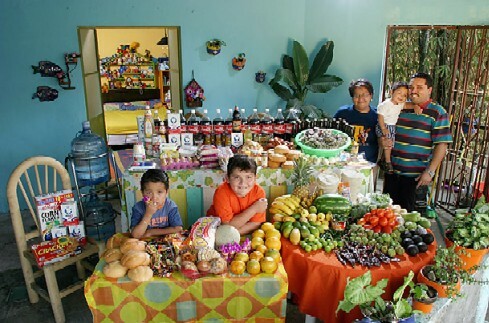 Each photo in the essay features a different family from around the world with one week’s worth of groceries spread out on the table. The captions tell you how much the food cost and highlight some of the family’s favorite foods . For example, this is the Casales family of Cuernavaca, Mexico. Their food expenditure for one week is 1,862.78 Mexican pesos or $189.09. Their favorite foods are pizza, crab, pasta, and chicken. Weekly food expenditures ran from as high as $500.07 for the Melander family in Germany to as low as $1.23 for the Aboubakar family in Chad (who also had much less food to eat). The photos show families and food from the following countries: Japan, Italy, Chad, Kuwait, United States, Mexico, China, Poland, Egypt, Ecuador, United States (again), Mongolia, Great Britain, Bhutan, and Germany.